“The Federal Reserve did not hike rates this week, but the market views future hikes as a near certainty. The expectation of future Fed rate hikes and increased borrowing by the U.S. Treasury is putting upward pressure on interest rates. 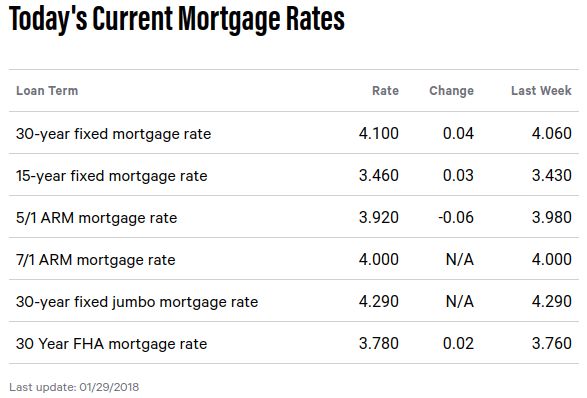 The 30-year fixed mortgage rate on Zillow Mortgages is currently 4.05 percent, up seven basis points from this time last week. 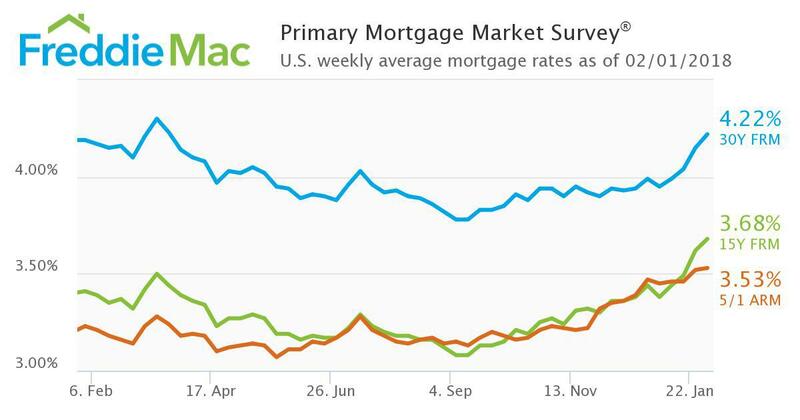 The 30-year fixed mortgage rate rose steadily throughout the week before dipping to the current rate today. The rate for a 15-year fixed home loan is currently 3.47 percent, and the rate for a 5-1 adjustable-rate mortgage (ARM) is 3.52 percent. The rate for a jumbo 30-year fixed loan is 4.21 percent. 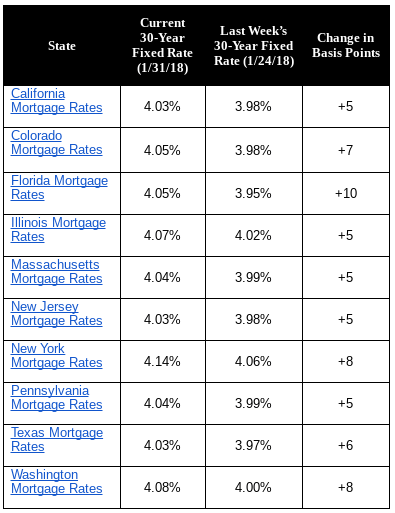 “Mortgage rates continued their upward momentum of the past three weeks, touching their highest levels since March,” said Aaron Terrazas, senior economist at Zillow. “Each new wave of economic data points to a tight labor market and steady GDP growth. These rosy fundamentals, combined with the larger federal borrowing as a result of tax reform, are putting upward pressure on mortgage rates. Mortgage applications decreased 2.6 percent from one week earlier, according to data from the Mortgage Bankers Association’s (MBA) Weekly Mortgage Applications Survey for the week ending January 26, 2018. The Market Composite Index, a measure of mortgage loan application volume, decreased 2.6 percent on a seasonally adjusted basis from one week earlier. 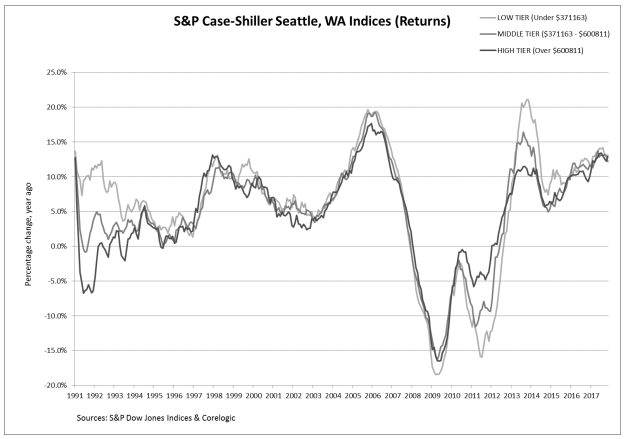 On an unadjusted basis, the Index increased 12 percent compared with the previous week. The seasonally adjusted Purchase Index decreased 3 percent from one week earlier. The unadjusted Purchase Index increased 15 percent compared with the previous week and was 10 percent higher than the same week one year ago. Real house prices increased 0.5 percent between October and November 2017. Real house prices increased 5.0 percent year over year. Consumer house-buying power, how much one can buy based on changes in income and interest rates, was unchanged between October and November 2017, and grew 0.9 percent year over year. Real house prices are 37.7 percent below their housing boom peak in July 2006 and 16.2 percent below the level of prices in January 2000. Unadjusted house prices increased by 6.0 percent in November on a year-over-year basis and are 6.3 percent above the housing boom peak in 2007. 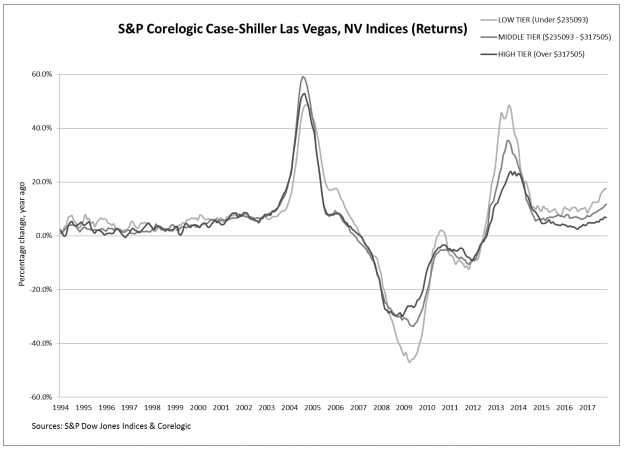 The S&P CoreLogic Case-Shiller U.S. National Home Price NSA Index, covering all nine U.S. census divisions, reported a 6.2% annual gain in November, up from 6.1% in the previous month. The 10-City Composite annual increase came in at 6.1%, up from 5.9% the previous month. The 20-City Composite posted a 6.4% year-over-year gain, up from 6.3% the previous month. Seattle, Las Vegas, and San Francisco reported the highest year-over-year gains among the 20 cities. 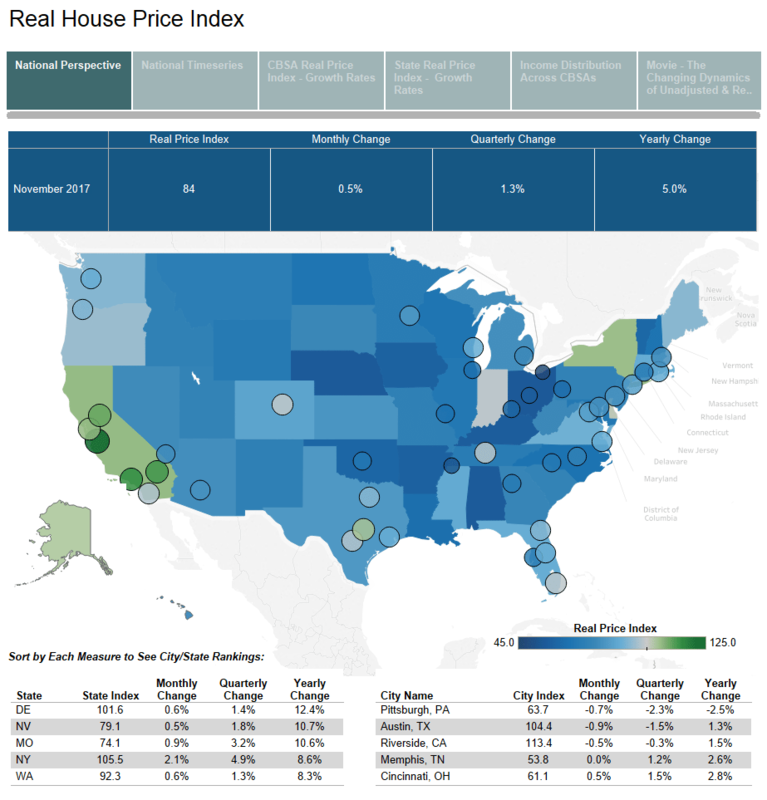 In November, Seattle led the way with a 12.7% year-over-year price increase, followed by Las Vegas with a 10.6% increase, and San Francisco with a 9.1% increase. 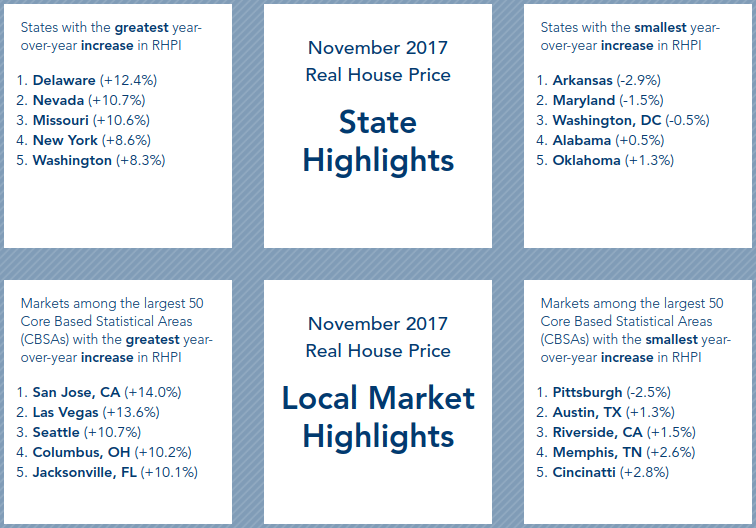 Six cities reported greater price increases in the year ending November 2017 versus the year ending October 2017. The average 30-year fixed-rate mortgage increased 7 basis points to 4.27 percent.